A little perspective is very valuable. The Dell W4200HD took top honors when we first reviewed it in comparison with plasma TVs from two other companies (HP and ViewSonic) that are also better known for their PC products. The Dell won that match by offering the best picture, but we cautioned then that its color quality might not hold up as well against models from more-established TV makers. And that's indeed what happened in our latest review of eight models: The W4200HD took last place for overall quality and for five of our seven subcategories (HDTV, DVD, bright-light viewing, color quality, and brightness and contrast). And its seventh-place showing for standard-definition content and fifth-place rank for detail were not great honors, either. Of the eight models we tested, it landed in sixth overall. But close wasn't close enough. The TV put way too much red in what should have been neutral shades; faces, for example, had an unnatural orange glow. However, the set didn't have enough oomph to reproduce saturated reds, as we should have seen in high-def footage from a classic car show or in Tobey Maguire's jersey in the Seabiscuit DVD. And programs received via the Dell's over-the-air tuner looked a bit washed out, as well. Our previous review commended the Dell's solid black levels, and we stand by that assessment, but that achievement was far overshadowed by the poor color performance. 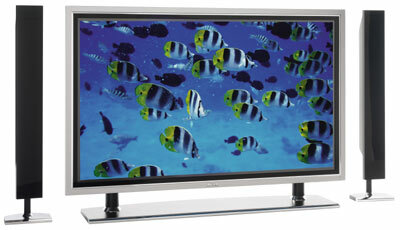 The results were especially disappointing because the W4200HD seems like it should be a far better TV. The slim, silver-edged panel looks sharp, as does the wide black tabletop stand. Like the Pioneer PDP-4350PU, Dell's TV comes with detachable speakers, so you can eliminate clutter if you opt to go with a separate surround-sound system instead of the bundled speakers. Dell also includes stands for the speakers, providing a third audio setup option. The remote control alone is worthy of a design award. Petite and glossy black with silver accents and buttons, it looks far more grown-up than the plastic lumps that come with most TVs. And despite having minimal buttons, it's handier than most competitors. The four-way directional pad, for example, provides volume adjustment (left and right) and channel selection (up and down); but when you enter the TV's nicely illustrated menus, it becomes a navigational control. In addition, the TV is rich in connection options, including one each for HDMI and DVI, and a generous three component-input sets. It also accepts both analog (VGA) and digital (DVI) input from a computer (perfect for hooking up a high-end media center PC). Stereo plus composite and S-Video inputs tucked on the side of the panel offer convenience without being unsightly. The one notable omission, however, is a slot for a CableCard. The set's built-in ATSC tuner can receive digital broadcasts only from an antenna. For HDTV from cable or satellite services, a set-top box is required. The unit's audio is adequate. The twin speakers, rated at 20 watts each, sounded a bit softer than those on some competing TVs, such as the LG 42PX4D and Pioneer PDP-4350PU. And its one surround-sound option, SRS True Surround XT, was not as enveloping as the audio on those other models. But the speakers are powerful enough to fill an average room, and they handled even heavy bass with minimal distortion at high volume. Upshot: The W4200HD's stellar industrial design is not matched with commensurate performance.